I took the picture above while on a family walk at Toronto's G. Lord Ross Park, located in the West Don River valley north of Finch Avenue. This is a great park for a long walk with the dog as it has an extensive nature trail. We especially love it in the spring when you can see the vegetation coming back to life and in the fall for the amazing colors on the trees! 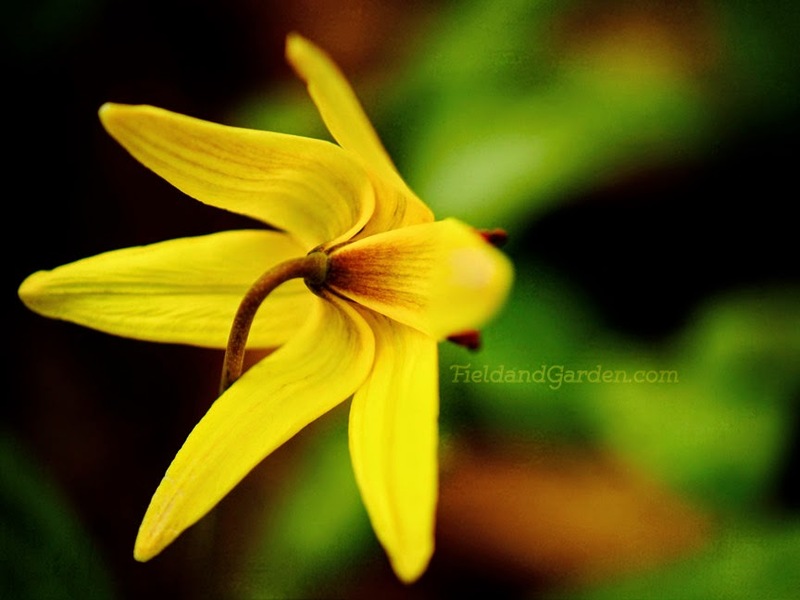 Also called adder's tongue, the yellow trout-lily (Erythronium americanum) is an ephemeral wildflower appears in the forests of Ontario each spring. They blanket the ground in mid-April but the blossoms are short-lived, appearing for only the briefest amount of time. When leaves start emerging on trees, the nascent canopy begins to block the sunlight from reaching the forest floor. This is the cue for the trout-lilies' foliage to die back, sinking back into the ground and leaving no trace of their presence until the following year. Here is a wonderful article on this little flower's name origins and how to propagate trout lilies in your backyard garden from the Canadian Wildlife Federation. Have you ever spotted this plant? Leave a comment and let us know! © 2016 FieldandGarden.com. All rights reserved.